At Strickland's Stratford Toyota we've got a car for every budget. We pride ourselves in offering value to our customers. Value to us means a great car at a great price all while enjoying your buying experience! 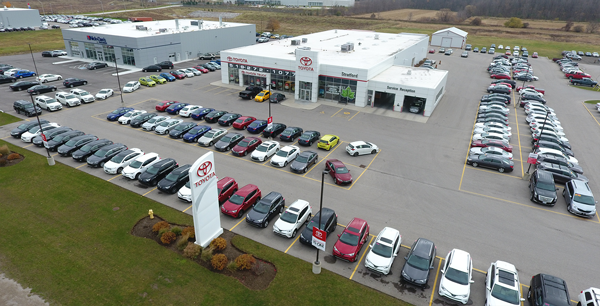 Built in 2010, Strickland's Stratford Toyota is Canada's FIRST Green Toyota Dealership. Earning LEED (Leadership in Energy & Environmental Design) Gold Status. Each day we strive towards a better, more sustainable future. Toyota has long led the way in the automotive industry since the Hybrid Prius debuted to much fanfare. We have many different makes & models to choose from. We carry the full line of Toyota product including new Toyota cars & trucks, new Toyota SUV's & Crossovers & Minivans! Our vast selection of used inventory consists of over 700 makes & models, Including used cars, used trucks, used SUVs & used crossovers, and last but not least used vans. We are currently located on Erie St. (Hwy 7, London to Stratford). We proudly serve the communities of Stratford, London, Kitchener, Waterloo, Cambridge, Woodstock, Mitchell, Tavistock, New Hamburg & More! Many drive as far as Owen Sound or Toronto to experience the Strickland's difference. Strickland's has 3 other locations across Ontario offering both new & used vehicles, including Strickland's Automart - Stratford, Strickland's Automart - Windsor & Strickland's Brantford Chevrolet Buick GMC Cadillac.